JUSTIN McROBERTS is an author, musician, and retreat leader. He lives in Oakland / San Francisco Bay Area with his wife and two children. SCOTT ERICKSON is a touring painter, performance artist, and creative storyteller who mixes autobiography, biblical narrative, and aesthetics to create art that speaks to our deepest experiences. Scott lives in Portland, Oregon, with his wife and three children. For more information, visit www.scottericksonart.com. The essence of prayer is the love of God, not our ability to pray. Which is not to say the mechanics of prayer don’t matter. The way we practice prayer matters very much. But without our deep realization that you and I are met in prayer by an immovable, sure, and relentless love, the mechanics of our practice inevitably slide toward primacy and weigh us down. The particular postures, words, and movements of our prayer practice should be helpful, clarifying, formative, and sometimes challenging. They should never be oppressive and never a source of shame. This book is a piece of art. This book is an act of love. This book is a redemptive tool. This book is a resource. This book is designed to stir, inform, and inspire you. The ongoing conversation between you and God is content. And it is a blessed gift to us that what we’ve created might help you recognize, celebrate, and dig into that content. Thank you for inviting us into it. When the disciples asked Jesus how to pray, He gave them what is now called the Lord’s Prayer. Scott and I chose to anchor this book in that prayer because we think Jesus taught it with the same heart and intention we hope emanates from these pages. He offered it as a way to delve into the vital, substantial, and extant reality that you and I are loved by God and empowered to love others likewise. He did not present it as a kind of final word on the practice of prayer, meant to be followed and executed as is, lest people pray wrongly. As the writer of Luke recounted it, immediately after teaching His disciples this prayer, Jesus placed it in the context of friends and fathers who give good gifts (11:5–13). Similarly, Matthew recalled Jesus prefacing this teaching with a reminder that God “knows what you need before you ask him” (6:8). It seems Jesus was bent on ensuring that His disciples saw this prayer framed by the goodwill of God, who wants good things for them. Prayer, at its heart, is about the love of God. May it be that nothing, including prayer, stands in the way of your knowing that love. We think that’s what Jesus was up to when He taught this prayer. We’re doing our best to follow suit. In high school it was the lyrical melancholy of Morrissey and the Smiths to which I pointed, saying, “Yes! That’s how I feel!” In college it was the wrathful poetics of Zack de la Rocha of Rage Against the Machine and Chuck D of Public Enemy that gave shape to my otherwise shapeless sociopolitical discontent. In countless moments throughout the course of my life and growth, the words of others have given me ways to hear myself, know myself, and see what is going on inside myself. My hope is that my words in this book can be the same kind of gift for you. These guided prayers are short, often only a single line. Is that enough? Just one line? I think it is. Because in writing these prayers, I’m not trusting my skill as a writer so much as the work of God in, around, and through you. I’m applying myself to help you see what’s already happening within you. Again, you are the content. And I think there’s far more to you than many (if not most) books assume. In one of the more comical scenes in Shakespeare’s plays, Polonius, the father of Hamlet’s love interest, Ophelia, attempts to strike up a conversation with young Hamlet. It doesn’t go well. So many words, words, words. “Though this be madness,” says Polonius, “yet there is method in ’t.”  I think that’s true too. There are jewels of all kinds in the contemporary and ancient writings available to us that don’t just add up to noise on top of noise. But it can be nearly impossible to find and identify those jewels when our vision is blurred and dizzied. He may be asking Hamlet if he will go inside out of the air or outside into it, depending on your reading of the Elizabethan. Regardless, Polonius is asking for a change of scenery. And part of what we’re doing with this book is acknowledging the chaos and confusion that often results from the torrent of religious words, words, words and offering a change of scenery. We’ll do that not only by providing fewer words but also pointing you toward images. We hope and expect the images herein will help you “walk out of the air” a bit, providing the kind of space and newness that allows for spiritual clarity. 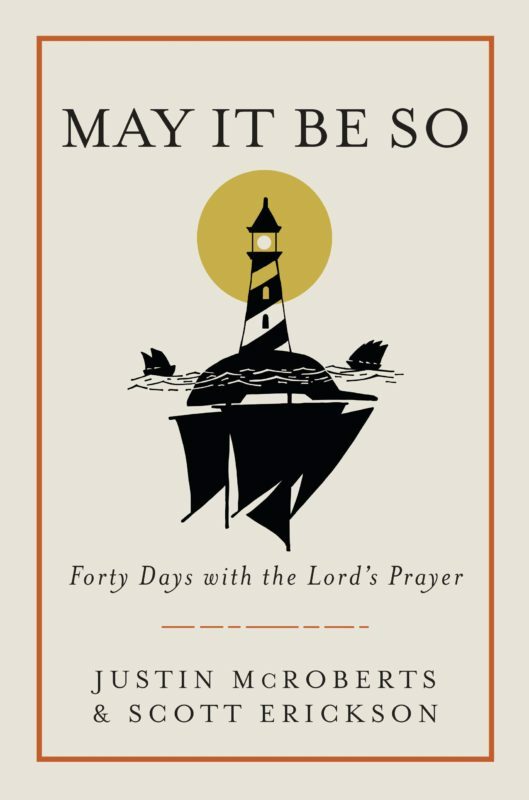 In our first book, Prayer, we invited you to experiment with various forms of prayer over the course of forty days, such as journaling, exercise, fasting, Scripture meditation, lament, and intercession. Here we encourage and challenge you to sit in one place for a while and focus on a single thing, namely, the Lord’s Prayer. I’ll ask you to pray through it and pause to reflect on a specific phrase in the prayer, and I’ll share stories and meditations drawn out of me by that same phrase. Both Scott and I value the conversation about God, gender, and personal pronouns. Is God male? Female? Both? Neither? Approaching the Lord’s Prayer meant deciding how we should address the topic, and in the end, we felt it was appropriate to use the language that is most familiar to readers. Because you most likely didn’t pick up this book to research the potential pitfalls of gender-focused anthropomorphism in religious practice. And even if that conversation is important to you, as it is to Scott and me, there are far wiser and more informed sisters and brothers reflecting and writing on the topic. We simply lack the space and wisdom to sufficiently and honorably approach it here while striving to achieve the ends of this work. That said, if the use of male pronouns is an obstacle for you, let us offer you this prayer: May your language be formed in relationship with God rather than letting a relationship with God be predicated on your use of the right words.